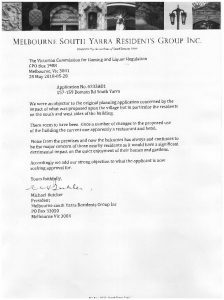 157-159 Domain licence update – Melbourne South Yarra Residents Group Inc. The owners of 157-159 Domain Road have applied to change the use of the building from apartments to a hotel. We have opposed their liquor licence application for the rooms and balcony.